There's a renewed sense of confidence over at AMD, and it's clear to see why. The firm's Zen architecture has powered a whole new generation of competitive Ryzen processors, culminating with the launch of muscular, many-core Threadripper CPUs just a few days ago. But AMD is adamant that the CPU alone isn't the answer to the industry's most complex calculations. To get the best of both worlds, you need a powerful, forward-looking GPU in tow, and in recent years the chip giant has struggled to deliver high-end solutions capable of competing with the very best from Nvidia. Can Radeon replicate Ryzen's resurgence? We're about to find out, as today is the day that AMD finally unleashes its eagerly-anticipated Radeon RX Vega graphics cards. 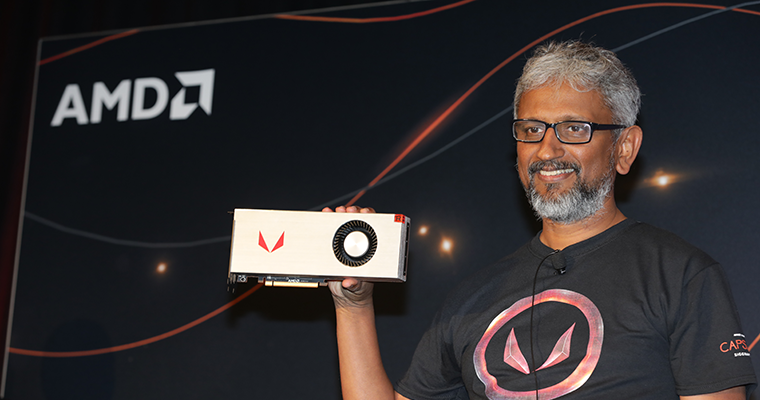 Arguably AMD's most important consumer GPU release to date, Vega emerges from the recently formed Radeon Technologies Group (RTG), whose senior vice president and chief architect Raja Koduri has the unenviable task of revitalising AMD's position as a graphics leader. Vega will define AMD's GPU portfolio for the years ahead, and its success will ultimately decide whether RTG will sink or swim. No pressure, then, so let's dive in and see what the first consumer Vega GPUs have to offer. AMD Radeon RX Vega: how does it compare? 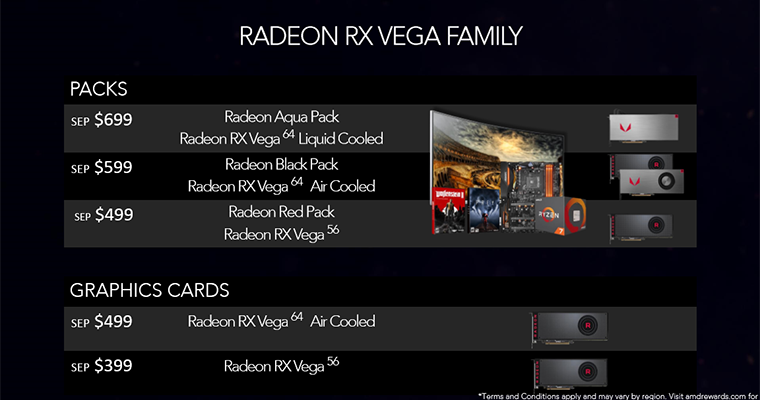 At launch, Vega hits the scene in a choice of two primary flavours; Radeon RX Vega 64 ($499); and Radeon RX Vega 56 ($399). 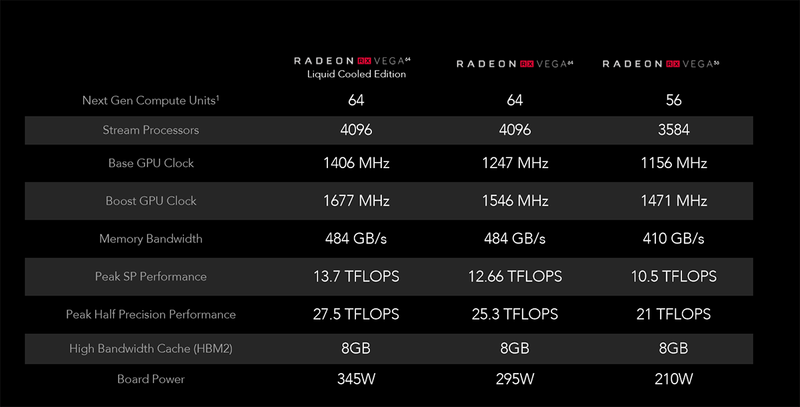 Putting the specifications in table form reveals a few important truths, and none more so than the fact that AMD fans have had to wait since mid-2015 for a successor to Fury X. The Vega cards have been a long time coming, and at first glance, Vega 64 and Vega 56 appear to have plenty in common with their predecessors, Fury X and Fury. The number of processors, texture units and ROPs goes unchanged, but Vega does benefit from a 14nm FinFET LPP manufacturing process that allows for higher clock frequencies. Peak GPU clock speed is up by almost 50 per cent compared to the previous generation, hence the considerable gain in peak gigaflops. Factor in double the frame buffer, superior HBM2 memory, an enhanced core architecture and you have the makings of a potent GPU, yet when it comes to real-world performance, AMD has openly admitted that RX Vega 64 will compete with Nvidia's third-rung card, the GeForce GTX 1080. Titan Xp and GTX 1080 Ti will go unchallenged for the time being, and RX Vega 56 will battle it out with GeForce GTX 1070 in the sub-$400 space. AMD's inability to compete at the top-end of the market may seem discouraging, however consumers can take solace in the fact that pricing will need to be aggressive. Launch-day retail prices for Vega 64 and Vega 56 are down roughly 25 per cent compared to Fury X and Fury, and AMD is offering extra incentives in the form of Radeon Packs. Available for a limited time, Radeon Packs bundle a Vega GPU with two free games, $100 off a Ryzen 7 CPU and motherboard combination, and $200 off a 34in Samsung C34F791 FreeSync monitor. A handy option to have if you're looking to delve into the AMD gaming ecosystem, though gamers wanting a standalone GPU upgrade may lament the fact that certain Vega GPUs are only available as part of Radeon Packs. The Limited Edition Vega 64, with silver cooler and solid-metal construction, can only be purchased as part of a $599 bundle while stocks last, and getting your hands on the Liquid Cooled Vega 64, which also happens to ship with higher operating frequencies, requires shelling out $699 for the top-of-the-range Aqua Pack. Unfortunate for gamers seeking a straightforward upgrade, but there's merit to the Radeon Packs in that they may prevent the mining crowd from gobbling up all of AMD's stock. Still, it's a shame not to be able to buy the liquid-cooled card as a standalone solution, and cooler choice is further hampered by the fact that custom partner cards from the likes of Asus and Sapphire aren't expected to become available in decent quantities until Q4 of this year. There's a lot resting on the reference cooler's ability to tame a 295W GPU, but before we take a closer look at the cards themselves, let's have a brief recap on architecture.